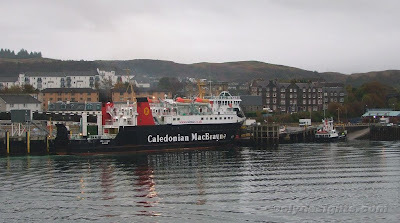 Seen early on Thursday morning at Oban, the CalMac car ferry LORD OF THE ISLES prepares to move from the original linkspan berth to the new berth that was completed recently. There she would load traffic for Colonsay, the island that lies approximately midway between Oban and Islay. On the right of the picture, the small ferry EIGG had just arrived from Lismore.